With Canadians consuming more and more energy every year, it's necessary to upgrade your electrical service to accommodate the extra power. 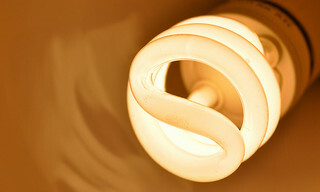 Air conditioners use more power than entire household did 40 years ago. If you're running a business or an institution, the need for reliable energy becomes all the more crucial. In order for your electrical equipment to function at its optimal capacity and to avoid short circuits, it is essential to heavy-up, or upgrade, your electrical service. When you need residential services, we will upgrade your system on time and at the reasonable price. So when you need an electrical contractor you can count on Han Electrical Contractor ltd. 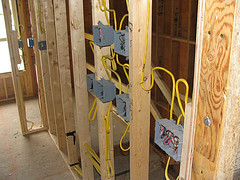 When it comes to the interior wiring of your home or office, it's best to leave the work to the experts. There is no room for error in the installation, maintenance, and problem solving of your electrical system. The electricians at Han Electrical Contractor Ltd. are your local interior wiring specialist, and we're proud to assist home and business owners. Ambience, aesthetic, beauty, security, safety, and mood are all affected by how you light your home. Our home lighting design strikes the perfect balance between function, creativity, and ambiance. At Han Electrical Contractor Ltd. we are always anticipating your present and future needs. Turn your house into a warm, inviting and luxurious home today. Quality custom home lighting design and installation creates the perfect atmosphere for every room in your home by accenting the architecture, illuminating the path to your front door, adding special fixtures, lanterns and sconces, setting the mood with dimmers and timers, and displaying your favorite art work. No matter what your custom lighting needs are, Han Electrical Contractor Ltd. can help you visualize and execute your visions with the optimum results. 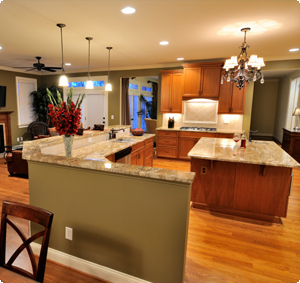 Let us transform your home with a custom lighting plan today! From expert home lighting design, installation and maintenance, Han Electrical Contractor Ltd. has all your specialty lighting needs covered. Landscape lighting is the perfect way to add beauty and security and Han Electrical Contractor Ltd. offers complete landscape lighting design solutions for your home. Landscape lighting is one of the most dramatic improvements that you can make to a home or garden. Han Electrical Contractor Ltd. has a team of experts that are dedicated to providing exceptional customer service and superior craftsmanship. Han Electrical Contractor Ltd. will provide you with the quality and professionalism you have been looking for when it comes to your custom landscape lighting needs. Ambiance and Entertainment– Create the perfect atmosphere for outdoor entertaining with landscape lighting. Illuminate pools, decks, patios, recreational spaces, and sitting areas long after the sun sets. Create mood lighting that gives your guests an experience they will not soon forget. Beauty – Accentuate the architecture of your home while showcasing its artistry and charm. Allow your guests to experience the beauty of your fountains, flowers, trees and shrubs. Create dramatic scenes that reveal the subtle contours, shapes and textures of your property. Motion tripped flood lights are a great way to protect your home and save energy at the same time because the lights only come on when you need them. Safety – Landscape lighting accents pathways, stairs, or any other potential hazards within your yard. Lighting helps you to navigate safely around your property while enjoying its beauty at the same time. 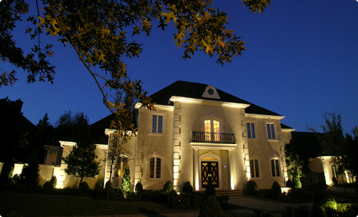 Added Value – Landscape lighting makes your home stand out from the rest. Well-placed lighting can add value to your property by improving the appearance of your home and landscaping. Lighting is a worthwhile investment that adds security, beauty and serenity to your property. No home is complete without landscape lighting design by Han Electrical Contractor Ltd. Take advantage of this opportunity to illuminate the beauty of your home and your landscape today. This is your chance to simultaneously increase the security, safety, ambiance, beauty and value of your home. Our professionals are ready to help you light the way to more beautiful surroundings. Copyright © Han Electrical Contractor Ltd.